Character. Cost: 7. STR: 11. Renown. No attachments except Weapon. Forced Reaction: After you win a challenge in which Mag the Mighty is participating, choose and kill a character you control. Then, the losing opponent chooses and kills a character he or she controls. If you save your character chosen for Mag the Mighty’s reaction, the pre-then aspect does not fully resolve and your opponent will not have to choose and kill a character. 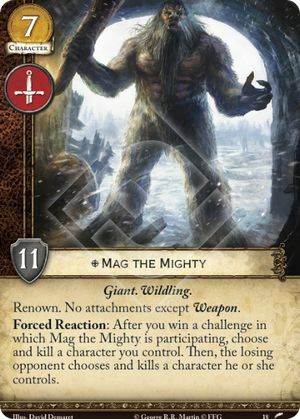 If Mag the Mighty is chosen to be killed for his reaction, the rest of the reaction will still resolve and the opponent must choose and kill a character.